After several web hosting issues during 2006, the decison was made to switch all of MetroAir’s online material to our own dedicated server. The switch was made during the fall of 2007 giving uninterrupted access to our website and forum and allowing the introduction of our own ACARS system. The cost of this switch was substantial. 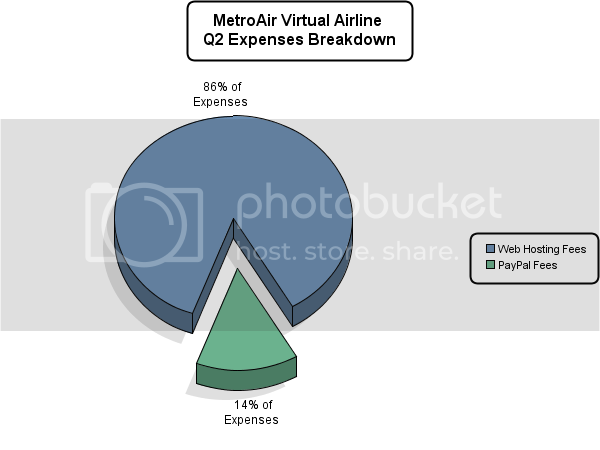 MetroAir’s annual hosting bill multiplied by a factor of almost 10. Our average annual bill currently stands at around $750 USD. 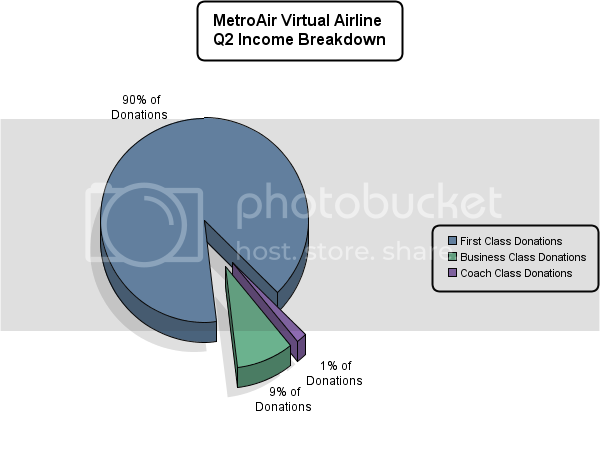 MetroAir’s fiscal year runs April to March and below is a breakdown of all donations made for Q2 June 2008 – September 2008. As of September 30th, 24 MetroAir pilots had made donations to our funds. During this same period, expenses for the airline came to a total of $207.60 Below is a breakdown of our costs. ================================================================Chief Executive Officer Statement: “Since donations can vary each month, MetroAir plans to ensure a full years of hosting funds are available. Once a full year of hosting fees are secured, MetroAir may begin looking into subscribing to digital information packages that the government charges for such as terminal charts and digital airac information to help improve our offerings on the website and within ACARS”. Chief Financial Officer Statement:** “The first three months of donations have been a tremendous success and the inital intake of funds have overwhelmed your management team. It is truly humbling to know that more than twenty of our non staff members feel strongly enough about our organization and fantastic community to donate to our cause and help MetroAir continue to grow. What is also amazing to see is that 90% of our supporters donated into the premium package, which again, has been a very pleasant surprise”. “Q2 donations have enabled us to secure 100% of the funding required for this quarters expenses. The remaining funds will be carried over to Q3 and so on until we have secured funding for the entire fiscal year. As Matt has already said, hopefully once we are in this position, we can think about using any extra funds to give something back to our community, possibly through competition prizes or purchasing charts and other digital material that will benefit the entire pilot base”. “May I take this oppertunity on behalf of the MetroAir management to thank all our donators for contributing to our airline. Your support is very much appreciated. We hope that in the coming months more of our members will be able to donate and be able to enjoy both the rewards that donating to MetroAir brings as well as contributing towards further rewards that funding may provide”.